First of all, let me begin this review by saying that I have never watched or read Ghost In The Shell. Beyond Pokemon (1997-ad infinitum) and Animatrix (2003), I’m not even sure I’ve consciously ever watched an anime, and I’ve certainly never read a manga. It’s not that it was deliberate, I just never had the opportunity or inclination to explore the medium. Over time, I began to associate anime with a culture of nerd I didn’t really want to join in on and so it never happened. That said, I was aware that Ghost In The Shell existed. Mostly because I adore Blade Runner (1982) and the cyberpunk genre and style, so it was bound to come up at least once in my entire life. Now, please bear with me while I gush over a film those who do know the source material probably despise. Directed by Rupert Sanders, and written by Jamie Moss, William Wheeler and Ehren Kruger, Ghost In The Shell (2017) takes place in the near-future, in an undisclosed city of Japan. By this point, the line between robot and human is becoming increasingly blurred, with cyber enhancements available for the rich and poor alike. From artificial eyes to whole limbs, the opportunities are virtually endless. At the top of this cyborg pyramid is Hanka Robotics, a typically suspicious future corporation with eyes on creating the future form of humanity. As described in the intro, this nightmare vision of the future involves placing the living brain of a human in a brand new body – or “shell” – creating the perfect blend of machine and man. We then witness the construction of one such creation – who were are introduced to as Mira Killian (Scarlett Johannsson), a young woman who was involved in a terrorist attack and unfortunately saved too late to recover her human body. Now the epitome of human evolution, Killian is assigned to a counter-terrorism unit called Section 9 and, over time, granted the rank of Major. Working alongside her are a band of roguish anti-heroes, all happy cybernetic volunteers, who hunt down and thwart terrorist attacks across the city. After one such attack, an intelligent terrorist leader starts to concern the powers above and Killian, who has started to experience odd glitches and visions, sets out to investigate and hunt down the cyber-terrorists that threaten Hanka Robotics. What follows is a moderately-action packed investigation that leads the principal cast from the seediest dens of iniquity to the highest levels of authority, all the while searching for the truth. While it’s true that the sentence above is a pretty standard cinematic cliche, I couldn’t help but love what I was seeing on the screen. Like I say, I am a massive sucker for the genre, and seeing vast holographic adverts loom above the slums and markets of wherever-the-hell-this-is-set really ticks a lot of boxes for me. Throw in the truly astonishing soundtrack by Clint Mansell and co. and I’m a happy camper. 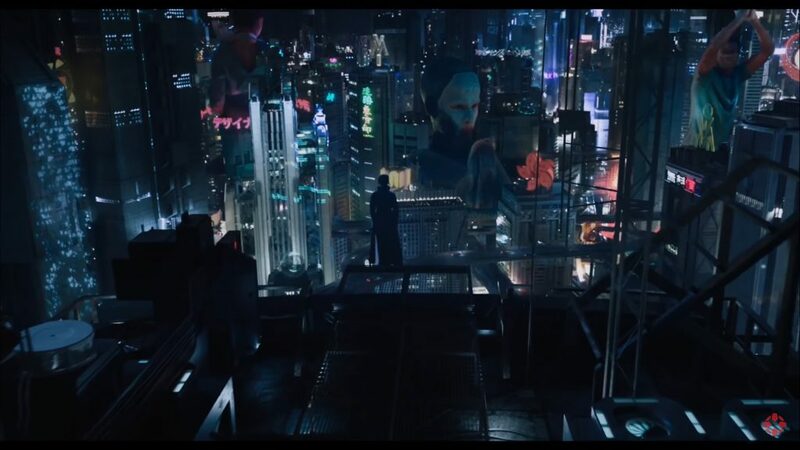 Ghost In The Shell also suffers from what I like to call the Blade Runner Syndrome – and not just because of the similar setting and tone. And themes. And characters. No, the BRS is when something attempts to tell a story that is way bigger than the format should probably try to handle. 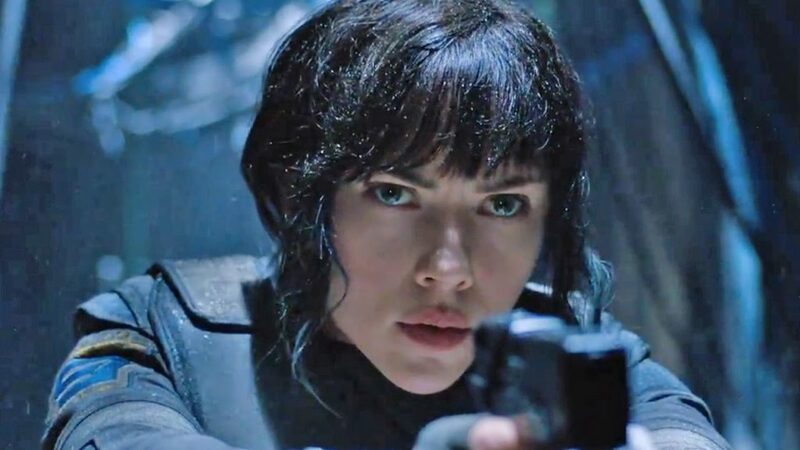 Just like Blade Runner, Ghost In The Shell seemed to jump around the plot to move forward – without necessarily giving the audience enough time to connect and understand the path of the story. For this reason, I’m actually seriously considering chasing up the original manga and anime of Ghost In The Shell. There is something I genuinely love about the story and setting, and I don’t quite feel ready to leave this world behind. Say what you like about adaptations, when they leave you desperate to soak up the rest of the franchise, it’s definitely done something right. PS. I mentioned the soundtrack, but I don’t think I’ve quite done justice to it. While I wrote the above, I found myself on the video below and absolutely fell in love. But then, that’s Gary Numan for you.